Earlier today, the Pope held another of his occasional "Cabinet" meetings with his dicastery chiefs. Yet while the latest of the sporadic conferences dealt with the fallout of the recent fiasco surrounding leaked Vatican documents -- a story whose resemblance to an Italian soap-opera has made it cat-nip for the global media -- a subsequent development served to underscore the degree to which the failures of the scandal are being chalked up more to failures of messaging than of governance. 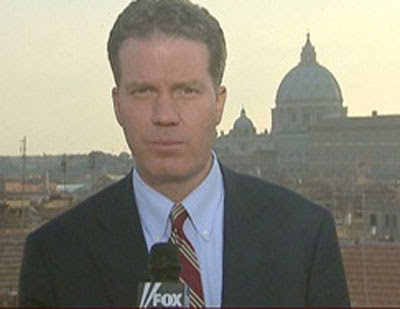 Turning to a highly-regarded hand among Rome's foreign press, the Associated Press leaked earlier this afternoon that Greg Burke (above right) -- Fox News' correspondent in the city since 2001 -- was hired by the Secretariat of State as a "senior communications adviser." According to the wire, the lead Vatican spokesman, Jesuit Fr Federico Lombardi, subsequently confirmed the move. The Curial office buffeted most intensely by the torrent of leaks, State likewise oversees the various media arms connected with the church's central governance: Vatican Radio and Television, L'Osservatore Romano, and the Holy See Press Office. The four were brought under the umbrella of the "clearinghouse" dicastery in 1984, when the new head of its Information Office, then-Msgr Crescenzio Sepe (today the cardinal-archbishop of Naples) brought aboard the duo who would become the lead framing agents of the pontificate of John Paul II: the Spanish journalist Joaquin Navarro-Valls to lead the Press Office, and the Italian Christian Democratic politician Mario Agnes to run the newspaper, which marked its 150th anniversary last year. Of course, Burke's nod likewise continues a legacy of Americans brought in to enhance the Holy See's media presence, a line begun by Philadelphia's own John Foley, who led the Pontifical Council of Social Communications from 1984 to 2007. Having moonlighted as the US media's lead Vatican liaison as well as the "patron saint of the Catholic press" both at home and beyond, the beloved graduate of Columbia University's School of Journalism was subsequently made a cardinal by Benedict, and kept up his many newsroom friendships until his death last December from leukemia at 76. A numerary of Opus Dei (like Navarro-Valls), the St Louis-born Burke -- who worked the Rome beat for TIME magazine before joining TV's most-watched news outlet -- will answer to the Sostituto at Stato, Archbishop Angelo Becciu, essentially the Vatican "chief of staff." In an AP interview, the newly-named consigliere compared his job to that of the White House Communications Director. "You're shaping the message, you're molding the message, and you're trying to make sure everyone remains on-message," Burke said. "And that's tough." Burke said he had previously been offered and declined the position twice. Following the day's earlier meeting with his Curial heads, Benedict held an evening round-table with four members of the College of Cardinals "who by virtue of their great and varied experience in the service of the church, not only in Rome but also around the world, can have an exchange of ideas and suggestions to help restore the desired climate of serenity and trust in the service of the Roman Curia," as a Vatican statement explained. The quartet included Cardinals George Pell of Sydney, the prefect of Bishops, the Canadian Marc Ouellet; the French Interreligious Czar Jean-Louis Tauran, and the Slovak Jozef Tomko, former head of the Congregation for the Evangelization of Peoples, who was one of the trio of retired red-hats tapped to oversee an internal investigation into the "Vatileaks" fuore. That group met at length with the Pope a week ago today. Winding down a three-month sabbatical in Rome, it's notable that the Australian prelate -- a keen provocateur universally described as some variation of "a bull in a china shop" -- was the lone non-Curialist to take part in the discussions. But that stands as an indicator of his enduring status as a papal favorite. In 2010, Pell had been widely expected to succeed Cardinal Giovanni Battista Re at the helm of the all-powerful Bishops' office, but the choice was switched to Ouellet in the final weeks after a particularly vicious power play had been engineered from within Vatican circles with the intent to block Pell's appointment.